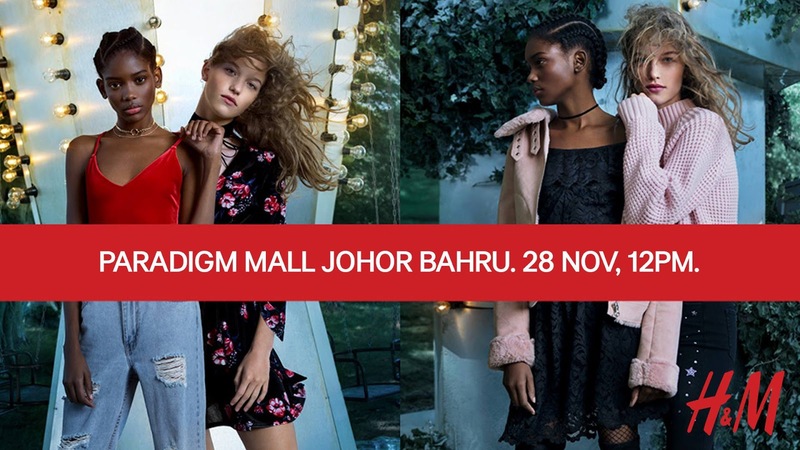 H&M Opening at Paradigm Mall, Johor Bahru on 28 Nov, 2017 ! H&M is expanding their fashion empire to Johor with a brand new store at Paradigm Mall, Johor Bahru ! The new H&M Store at Paradigm Mall will open their doors on 28 Nov 2017, 12pm, making it just in time for the year-end festivities. Shoppers will be able to do some holiday shopping and of course the not to be missed exciting opening day giveaways! From the glamourous new goth to punky après-ski princess, H&M’s Holiday womenswear collection focuses on statement textures and power dressing with key pieces like a tulle maxi dress with embroidery, sheer maxi-length skirt, high-waisted plaid trousers, a fuzzy faux fur coat, sparkly knit jumper and ski-inspired stretchy stirrup trousers. For menswear, the collection mixes formal with sportwear, including classics like tuxedo blazer and button up shirts teaming up with soft, comfortable sporty separates such as the satin bomber jacket, half-zip knit top, sweatshirts and tailored trousers with feature piping for a more relaxed vibe. In celebration of the new store opening, the first 100 customers in line will receive an exclusive H&M tote bag and RM80 shopping vouchers. Whereby the next 50 customers in line will receive an exclusive H&M tote bag and RM50 shopping vouchers. There will be a lucky draw to determine 1 lucky winner who will win a RM500 shopping voucher from the first 150 customers in line. All vouchers are valid only on the day of the opening and at H&M Paradigm Mall, Johor Bahru. H&M Paradigm Mall Johor Bahru is located at Lot GF-12, Paradigm Mall Johor Bahru, Jalan Skudai, 81200 Johor Bahru.